Just like surfaces were deep and complex, despite their apparent shallowness, knowledge about surface inscriptions reaches far beyond the surfaces and the inscriptions. Interactions between tags and street signs and between construction hoardings and managed murals are fascinating and offer endless scope for examination in themselves, but ultimately, they are the visible results of ideas about cities, challenges to those ideas, and the policies put in place to manage these tensions. In that respect, the sign is the city – marks, plaques, traces, scribbles, placards, signboards and inscriptions are visual and material translations of the urban organism, as complex, contradictory, plural and chaotic as the city itself. The sign is the city, the sign is wise and insightful, the sign is unassuming yet astute in its demonstration of the city. Signs show us cities and they are uniquely mannered, so that each city will have the signs it incites and permits. On a holiday trip with a group of friends, we stopped in front of a building in the old centre of Valencia to discuss the fact that it – and most buildings surrounding it – were extensively covered in tagging. My friends could find little merit in this, and they read the tags as signs of a neglected, failing, deteriorating city. I disagreed, arguing the tags could equally be read as signs of an active, claimed, lived city, whose inhabitants or travellers were engaged enough to leave their marks on its surfaces. A sign-less city is a non-city, just like a tag-less city is an absolutist city. 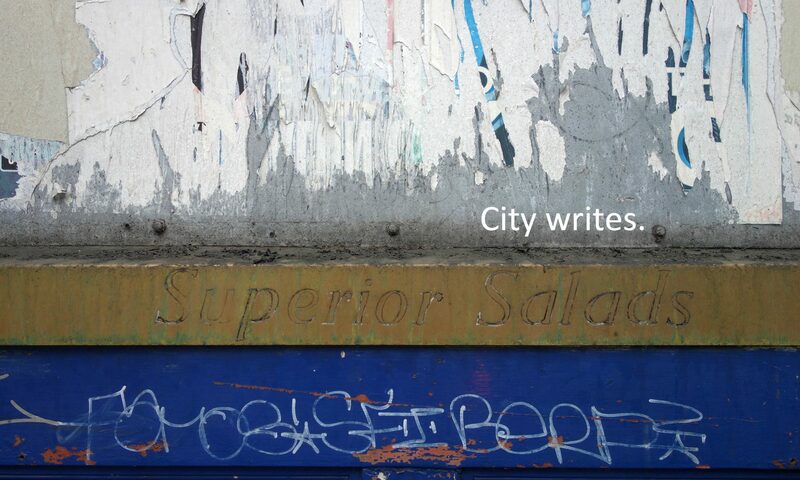 Tags are signs of the decaying city, but they are also signs of the animated city. “So how would you feel about a city whose surfaces were all saturated by graffiti, if everything was entirely covered in graffiti?”, a student once asked me. What kind of city would this signify? Graffiti or tagging as a single surface discourse is just as dangerous a thought as the mural city, the notice city, or the advertising city: the single discourse is a sign of dictatorship and exclusion. Signs are cities, and multiple signs are cities of plurality.